Home » Forums » General discussion » Music Man Guitars (6-string) » Lets hear from you musicman guitar guys! Lets hear from you musicman guitar guys! 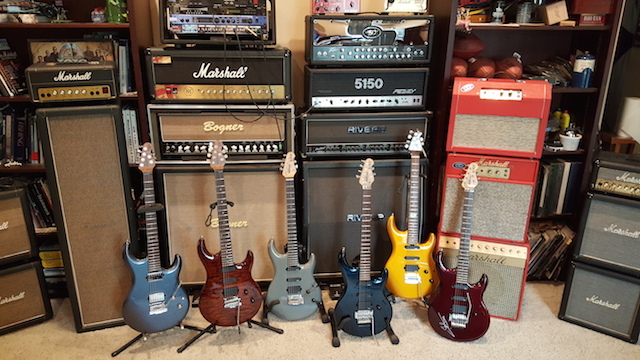 I know alot of people who come to this site think if I don't have a musicman from the 70's this site don't care about me ,not true !There are alot of great guitars invented for Mr Ball that bear the Musicman logo.I would love to hear how you feel about your axis/van halen or your Steve Morse model or my fav the Luke.If you got a sabre that's great too,lets just hear something ,ok? Well I currently have 5 Musicman guitars. For me this is the perfect guitar, and I know it's kind of strange coming from a Les Paul Custom background (yes I still have that too! ), but I love the single coils, as well as feel, playability and ease of set up of the guitar. It has a trem & a Piezo which I run thro an AER acoustic amp, and I run my mags to my MM RP112 amp. :-)) It differs to the first insofar it has MM90 pickups and a rosewood board (not common in 2006). My 3rd Albert is my lightest guitar ever weighing in at just over 6lbs. It's different too being a hardtail and has titanium saddles. My Van Halen is a hardtail - one of 200 built and is a real thing of beauty having a great tiger flame in the body and a nice birdseye neck. Finally my JP6 - this was in a "sorry state" when I got it and I had to do a lot of work to it. It's great now - but I'm letting it go to find another MM guitar. and if you view the hyperlinks in my Ernie Ball signature, you can see pictures of my guitars. You then need to click on the TAB "About Me". I too am a HUGE fan of the EBMM guitars especially the Luke. Here is a picture of my Luke's.